Bulgarian history is not only Thraceans and Romans treasures, not only Medieval remains and Ottoman heritage. It is as well the Еra of Socialism (Communist regime), that has left behind a lot of heritage. Join our tour to discover something different and new. There are many ways to discover it. Now we are offering you something unusual and unique. Are you ready for something different and new? Arrival at Sofia airport. Here your will pick up your car and start the journey. Take your time to relax and now you can make your walking tour, because all most interesting points are in the city center, called “Historical mile”. Having a map, you can easily find main historical sites from socialist period – Monument of the Soviet Army, The Common Grave, ex-House of the Party, Largo with buildings in typical Stalin-style architecture, TSUM (ЦУМ, by analogy with the largest shopping center in Moscow), main buildings from the same period in the city center, National Palace and the Museum of Socialism. Besides you will see also ancient sites as The Rotunda, Serdica fortress, St Sofia basilique, Alexander Nevski Cathedral, Russian church, National Theater, the Mosque and the building of old Bath, where nowadays is settled Museum of Sofia. Overnight in the hotel in Sofia. Departure to Pravets – birth place of the last Bulgarian communist leader Todor Zhivkov. Visit of his family house and his monument. Departure to the town of Pernik. The town of Pernik is also known as the Town of Black Gold. The development of Pernik is closely related to mining. During the Communist rule of Bulgaria it was called Dimitrovo between 1949 and 1962 after Bulgarian Communist leader Georgi Dimitrov. Visit to the Museum of mining, established in 1986. Is not housed in a building, but it is a part of an underground gallery. The first dig in the mine, in which the museum is housed, was performed in 1891. It was effective until 1966, when its deposits were exhausted and it was closed, and after about 20 years it turned into a museum. The town was named after the Bulgarian communist leader, statesman and General Secretary of Comintern in 1935 - 1943, Georgi Dimitrov. The town was built by thousands of young people called “brigadiri” (members of a brigade) and part of them settled it. Dimitrovgrad became an important industrial centre with many factories and plants. It also developed as vegetable growing centre, the second largest in Bulgaria, after Plovdiv. The town is connected with the life and works of Bulgarian poet Penyo Penev (1930 - 1959), who did glorify the life of the workers. That’s why he became famous as the “poet with the quilter jacket”. Departure to the town of Stara Zagora. The Monument of Friendship and buildings from the socialist past are your first stop. You will see as well many remains from different times, as Stara Zagora is at the cross-roads of multiple civilizations and an important piece in the European cultural routes mosaic. Inhabited by ancient Thracians, Romans, Ottomans and Bulgarians, this unique city bears the historical imprint of those past civilizations along with many of their historical treasures. Departure to the Bouzludzha peak where you will see the Buzludzha Monument. It was built by the Bulgarian communist regime to commemorate the events in 1891 when the socialists led by Dimitar Blagoev assembled secretly in the area to form an organized socialist movement with the founding of the Bulgarian Social Democratic Party, a fore-runner of the Bulgarian Communist Party. The Monument was opened in 1981. No longer maintained by the Bulgarian government, it has fallen into disuse. The Monument was opened in 1981, but not longer maintained. For the adventurists there will be a quick walk to the Monument (it is very old and in bad condition, so you should sign a declaration that you visit the site on their own responsibility) . Now you can make acquaintance with one of the oldest cities all over the world. 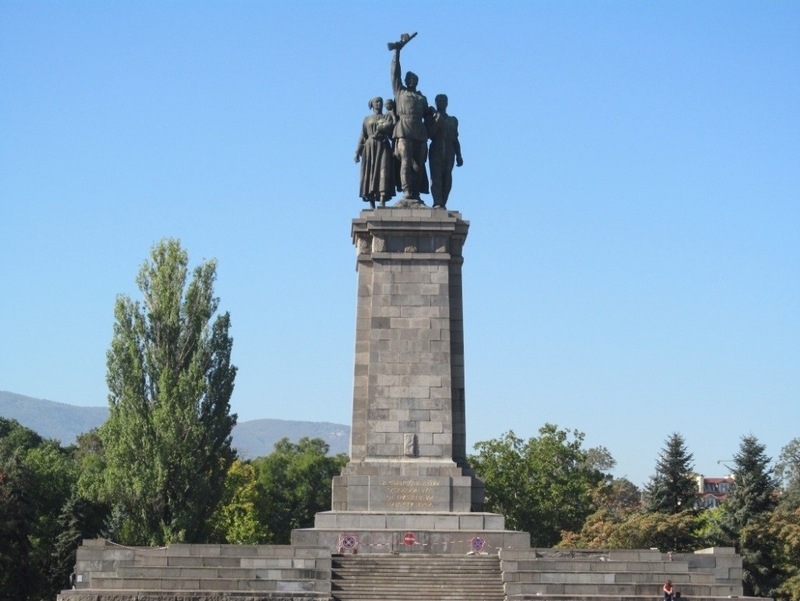 But first you will visit the hill Bunardzhika with The Monument of Soviet Soldier, named Aliosha, on the top. Then we shall go to the city center and shall pass by Trimontium Hotel and The Post Office, that are typical examples of socialist architecture. Then you will delve into antiquity and medieval ages. You will see preserved Aancient Theater, the Roman Stadium, and Old City with buildings from Bulgarian Revival, etc. Our journey will allow you to touch and discover the magic of this city. *Lunch. Free time to enjoy the city by your own. Free time to buy gifts and souvenirs before the transfer to the airport and your flight. Economy car rental – the cars have all necessary insurances and payed road taxes. The driver must have clean driving license. Phone assistance during the program.